www.cheersonline.com 20 • March 2015 trend, but rather a convenience trend," Rogers says. "Other newcomers, like Ménage à Trois Vodka, are prime examples of targeting consumers through occasions," he adds. 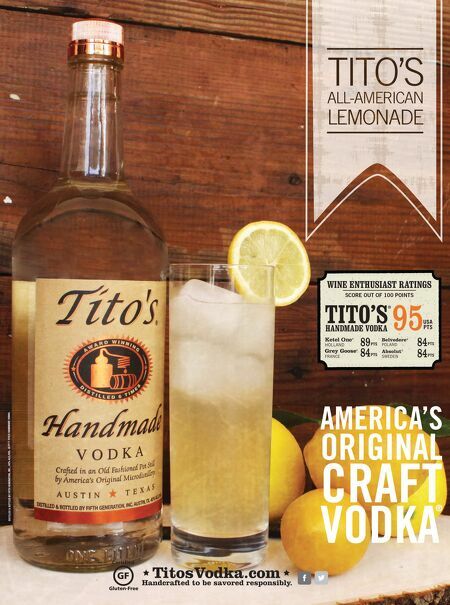 "In the case of Trinchero Family Estate's vodka extension of its popular Ménage à Trois Wine (an Established Growth Brand itself ), the company is seeing brand loyalty as consumers cross from wine to spirits." Rogers expects 2015 to be an even better year for the wine and spirit categories, with more winning Growth Brands. "Current economic factors like lower gas prices are expected to bring people back to the on-premise," he says. "Also, many suppliers have recently invested in the off- premise, which was quicker to return to pre-recession levels. So both the on- and off-premise are primed for increased consumer demand." 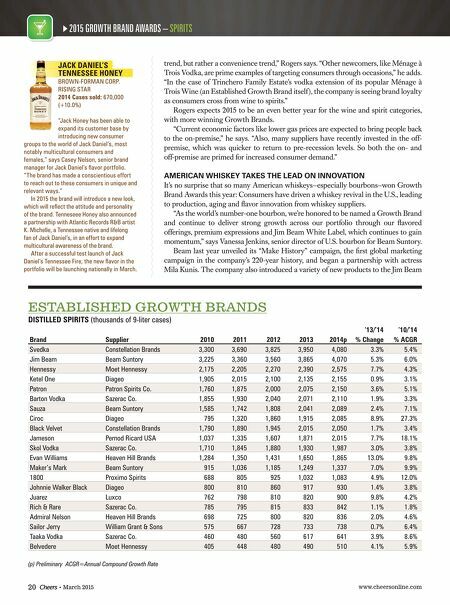 AMERICAN WHISKEY TAKES THE LEAD ON INNOVATION It's no surprise that so many American whiskeys—especially bourbons—won Growth Brand Awards this year: Consumers have driven a whiskey revival in the U.S., leading to production, aging and fl avor innovation from whiskey suppliers. "As the world's number-one bourbon, we're honored to be named a Growth Brand and continue to deliver strong growth across our portfolio through our fl avored offerings, premium expressions and Jim Beam White Label, which continues to gain momentum," says Vanessa Jenkins, senior director of U.S. bourbon for Beam Suntory. Beam last year unveiled its "Make History" campaign, the fi rst global marketing campaign in the company's 220-year history, and began a partnership with actress Mila Kunis. The company also introduced a variety of new products to the Jim Beam ESTABLISHED GROWTH BRANDS DISTILLED SPIRITS (thousands of 9-liter cases) '13/'14 '10/'14 Brand Supplier 2010 2011 2012 2013 2014p % Change % ACGR Svedka Constellation Brands 3,300 3,690 3,825 3,950 4,080 3.3% 5.4% Jim Beam Beam Suntory 3,225 3,360 3,560 3,865 4,070 5.3% 6.0% Hennessy Moet Hennessy 2,175 2,205 2,270 2,390 2,575 7.7% 4.3% Ketel One Diageo 1,905 2,015 2,100 2,135 2,155 0.9% 3.1% Patron Patron Spirits Co. 1,760 1,875 2,000 2,075 2,150 3.6% 5.1% Barton Vodka Sazerac Co. 1,855 1,930 2,040 2,071 2,110 1.9% 3.3% Sauza Beam Suntory 1,585 1,742 1,808 2,041 2,089 2.4% 7.1% Ciroc Diageo 795 1,320 1,860 1,915 2,085 8.9% 27.3% Black Velvet Constellation Brands 1,790 1,890 1,945 2,015 2,050 1.7% 3.4% Jameson Pernod Ricard USA 1,037 1,335 1,607 1,871 2,015 7.7% 18.1% Skol Vodka Sazerac Co. 1,710 1,845 1,880 1,930 1,987 3.0% 3.8% Evan Williams Heaven Hill Brands 1,284 1,350 1,431 1,650 1,865 13.0% 9.8% Maker's Mark Beam Suntory 915 1,036 1,185 1,249 1,337 7.0% 9.9% 1800 Proximo Spirits 688 805 925 1,032 1,083 4.9% 12.0% Johnnie Walker Black Diageo 800 810 860 917 930 1.4% 3.8% Juarez Luxco 762 798 810 820 900 9.8% 4.2% Rich & Rare Sazerac Co. 785 795 815 833 842 1.1% 1.8% Admiral Nelson Heaven Hill Brands 698 725 800 820 836 2.0% 4.6% Sailor Jerry William Grant & Sons 575 667 728 733 738 0.7% 6.4% Taaka Vodka Sazerac Co. 460 480 560 617 641 3.9% 8.6% Belvedere Moet Hennessy 405 448 480 490 510 4.1% 5.9% (p) Preliminary ACGR=Annual Compound Growth Rate 2015 GROWTH BRAND AWARDS – SPIRITS JACK DANIEL'S TENNESSEE HONEY BROWN-FORMAN CORP. RISING STAR 2014 Cases sold: 670,000 (+10.0%) "Jack Honey has been able to expand its customer base by introducing new consumer groups to the world of Jack Daniel's, most notably multicultural consumers and females," says Casey Nelson, senior brand manager for Jack Daniel's fl avor portfolio. "The brand has made a conscientious effort to reach out to these consumers in unique and relevant ways." In 2015 the brand will introduce a new look, which will refl ect the attitude and personality of the brand. Tenneseee Honey also announced a partnership with Atlantic Records R&B artist K. Michelle, a Tennessee native and lifelong fan of Jack Daniel's, in an effort to expand multicultural awareness of the brand. After a successful test launch of Jack Daniel's Tennessee Fire, the new fl avor in the portfolio will be launching nationally in March.